Matt Kress is a fine artist who lives and works in St. Petersburg. His work can be seen in art shows and galleries all over the city. He creates intricate paintings that with multiple layers of figures and geometric shapes that make you want to stop and stare for as long as possible. His work is visually stunning and highly detailed. 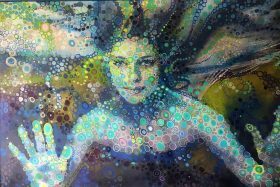 The images in his work seem to swim or float on the canvas or wall that they are painted on, and the overall look is mesmerizing.